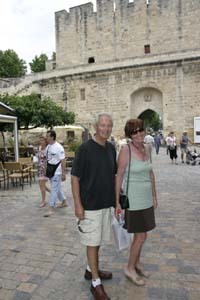 Tom and Kathleen Novasic of Milwaukee and Sarasota enjoy the medieval town of Aigues-Mortes during their two week tour with European Focus. Tom read an article about us in the Sarasota Herald Tribune three years ago. He kept that article and started planning their tour to France, Germany and Switzerland in the early spring of 2006. Now, here they are!